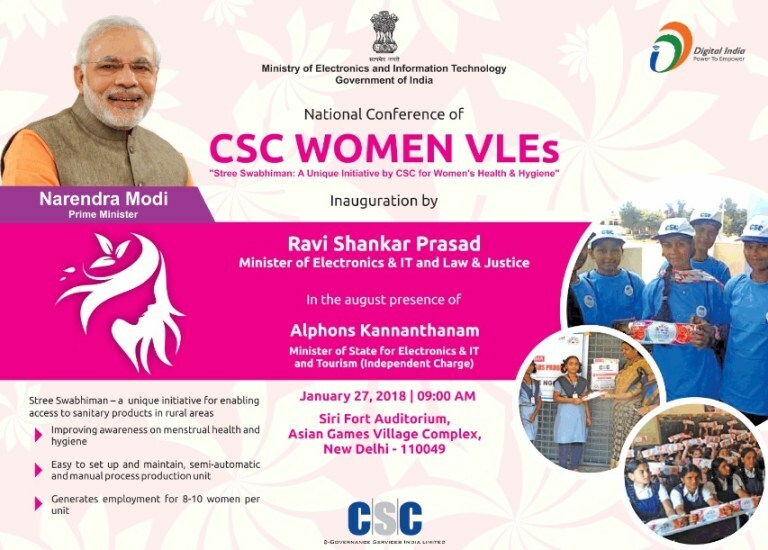 Context: Ministry of Electronics and Information Technology has announced an initiative by common services centres (CSCs) on women’s health and hygiene. The initiative is named ‘Stree Swabhiman’. ‘Stree Swabhiman’ aims to create a sustainable model for providing adolescent girls and women an access to affordable sanitary products by leveraging CSCs. Under the ‘Stree Swabhiman’ project, sanitary napkin micro manufacturing units are being set up at CSCs across India, particularly those operated by women entrepreneurs. The initiative is driven by awareness and personalised outreach by women entrepreneurs who produce and market sanitary napkins themselves. Context: Aiming to eradicate malnutrition among children, Congress MP Jyotiraditya Scindia has introduced Child Nutrition and Development Nodal Agency Bill, 2017 in the Parliament. 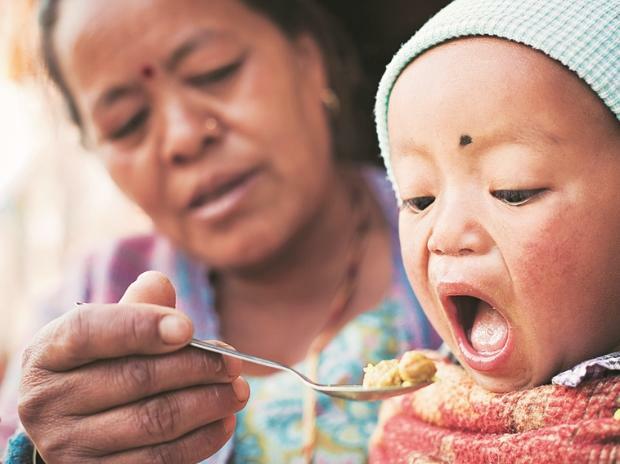 The bill proposes setting up a nodal agency for child nutrition and development. Despite thousands of crores of rupees being spent and a number of government schemes working for child development, the status of health and nutrition of children in the country remains abysmal. All nutrition-specific and nutrition-sensitive schemes work in silos. As a result, they are not able to achieve the intended outcome. Therefore, the establishment of a nodal agency that would facilitate coordination of all ministries and departments and execute the schemes in a convergent manner is urgently required. The body would facilitate and supervise multi-sectoral programme in high, medium- and low-burdened districts with malnourished children. It would coordinate and administer policy implementation among various ministries responsible for implementing programmes aimed at eradicating malnutrition. At the end of each financial year, the agency will submit a report of its activities to the Central government. The need of the hour is to involve all field functionaries in a productive manner. Consistent monitoring and evaluation of the schemes using technological interventions and real-time data is also important. There is also a need to provide leverage budgets from related departments to develop an integrated plan with cross-sectoral collaboration to achieve nutrition-related targets. Context: Concerned over any entry of polio virus from other countries, the government has launched Pulse Polio programme for 2018. In order to mitigate the risk of poliovirus importation, the immunity against polio infection is maintained through National and Sub-National Polio rounds along with sustained high quality polio surveillance. For additional protection, the government has also introduced the injectable Inactivated Polio Vaccine (IPV) into its routine immunization program. In India the last polio case was recorded on 13 January 2011. 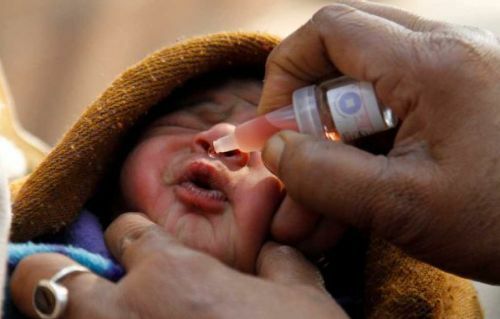 India maintains a sensitive surveillance system for polio. All cases of paralysis with sudden onset in children up to 15 years (which is called Acute Flaccid Paralysis or AFP) are picked up by the polio surveillance network. Each of these cases is followed up and their stool samples tested for poliovirus in World Health Organization (WHO) accredited laboratories. In addition, sewage samples are collected from over 30 sites spread across the country for poliovirus detection at regular intervals. IPV is produced from wild-type poliovirus strains of each serotype that have been inactivated (killed) with formalin. As an injectable vaccine, it can be administered alone or in combination with other vaccines. IPV is an evidence-based intervention that not only ensures continued protection of children against all types of polio viruses, but also helps save vaccine — a move bound to positively impact global vaccine supply in the coming years. IPV provides serum immunity to all three types of poliovirus, resulting in protection against paralytic poliomyelitis. India became the first country globally to introduce fractional doses of IPV in childhood immunisation programme in eight states and Union territories in early 2016. Celebrating 25 years of the India-ASEAN relationship, the Airports Authority of India (AAI) has signed a historic agreement with Lao Air Traffic Management, Department of Civil Aviation, Lao PDR, for providing SkyRev360, a comprehensive e-data gathering, invoicing and collection system. What is it? SkyRev360 is a fully automated and comprehensive data gathering, invoicing and collection service which eliminates inaccuracies, errors and delays for better revenue management. SkyRev360 has been developed in collaboration with the International Air Transport Association (IATA) under the Government of India’s Make in India initiative. What it does? SkyRev360 automates data processing, helping ANSPs overcome strenuous manual processes which are prone to mistakes. A collaboration between two experts of the aviation industry: IATA and the Airports Authority of India (AAI). The solution gathers 100% of your flight data and produces comprehensive billing data. Therefore, with SkyRev360, ANSPs’ financial operations become both more accurate and efficient in one stroke. Data gathering and processing module: SkyRev360 can ensure the essential data for your invoices is always the latest and most complete. Invoicing module: The system maintains all account attributes and allows for an extensive view of associated data, including aircraft specifications, flight movements, billing ledger records, etc. Collection: All collections are managed with the IATA Enhancement & Financing Services (E&F) process, which offers efficiencies and automation to ANSPs and airlines by settling through IATA Settlement Systems. Airline queries: The IATA team handles all queries and disputes related to billing and collection from your air operators. Dashboard and reports: Incident reports, airspace usage, traffic volumes, economic values and more are always at your fingertips. Context: The Finance Ministry is planning to initiate a performance review of heads of public sector banks that are under the RBI’s Prompt Corrective Action (PCA) as part of the reform process. So far, the Reserve Bank has put 12 public sector banks under watch in view of poor performance on parameters such as high levels of non-performing assets (NPAs), low capital level and low return on assets. These parameters indicate the financial health of banks and a need to initiate remedial measures to put them on the right course. NASA recently awarded a grant of $330,000 USD to the University of Akron to research the potential of blockchain technology to improve space communications. NASA wants ways to reduce the time it takes for their exploration vehicles to receive signals and react to potential threats in space. Also, a decentralized blockchain would ensure there is no degradation or loss of the critical data collected by vehicles in space. A major hurdle of space exploration today is the distance between the machines in space and their Earth-based controllers. The distance creates a time lag between machine and operator. Semi-autonomous machines eliminate some of the barriers created by this time lag, by allowing the machines to make some decisions for themselves. Blockchain is the digital and decentralized ledger that records transactions without the need for a financial intermediary, which in most cases is a bank. A blockchain is an anonymous online ledger that uses data structure to simplify the way we transact. Blockchain allows users to manipulate the ledger in a secure way without the help of a third party. Blockchain enables two entities that do not know each other to agree that something is true without the need of a third party. As opposed to writing entries into a single sheet of paper, a blockchain is a distributed database that takes a number of inputs and places them into a block. Each block is then ‘chained’ to the next block using a cryptographic signature. This allows blockchains to be used as a ledger which is accessible by anyone with permission to do so. If everyone in the process is pre-selected, the ledger is termed ‘permissioned’. If the process is open to the whole world, the ledger is called unpermissioned. Context: A long lost NASA satellite has been found alive. 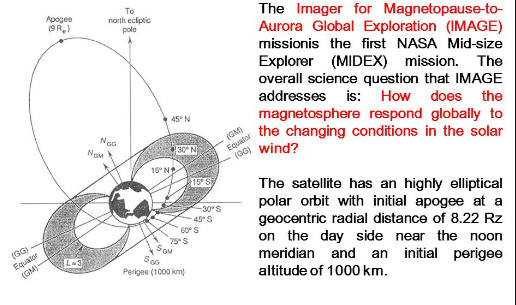 NASA has confirmed it stumbled across radio transmissions from Imager for Magnetopause-to-Aurora Global Exploration (IMAGE) science satellite, which lost contact with mission control over 12 years ago. On march 25, 2000, NASA launched the IMAGE satellite atop a Delta II rocket. The unmanned orbiter kept an eye on the Earth’s magnetosphere and how it reacts to the solar winds. Then on December 18, 2005, radio contact was lost for unknown reason. After weeks of attempts by NASA to regain contact, the probe was written off for good. IMAGE was the first satellite mission dedicated to imaging the Earth’s magnetosphere, the region of space controlled by the Earth’s magnetic field and containing extremely tenuous plasmas of both solar and terrestrial origin. Invisible to standard astronomical observing techniques, these populations of ions and electrons have traditionally been studied by means of localized measurements with charged particle detectors, magnetometers, and electric field instruments. Instead of such in situ measurements, IMAGE employed a variety of imaging techniques to “see the invisible” and to produce the first comprehensive global images of the plasma populations in the inner magnetosphere. With these images, space scientists were able to observe, in a way never before possible, the large-scale dynamics of the magnetosphere and the interactions among its constituent plasma populations. Identify the dominant mechanisms for injecting plasma into the magnetosphere on substorm and magnetic storm time scales. Determine the directly driven response of the magnetosphere to solar wind changes. Discover how and where magnetospheric plasmas are energized, transported, and subsequently lost during substorms and magnetic storms. Context: Beating the Retreat ceremony will be held on 29th January. What is it? The Beating Retreat ceremony officially denotes the end of Republic Day festivities. It is conducted on the evening of 29 January, the third day after the Republic Day. It is performed by the bands of the three wings of the military, the Indian Army, Indian Navy and Indian Air Force. Colours and Standards are cased and flags lowered. The ceremony creates nostalgia for the times gone by. ‘Beating the Retreat’ has emerged as an event of national pride when the Colours and Standards are paraded. The ceremony traces its origins to the early 1950s when Major Roberts of the Indian Army indigenously developed the unique ceremony of display by the massed bands. ‘Beating Retreat’ marks a centuries old military tradition, when the troops ceased fighting, sheathed their arms and withdrew from the battlefield and returned to the camps at sunset at the sounding of the Retreat. Context: Researchers have found a new population of red handfish in the waters off Tasmania. The red handfish is believed to be the world’s rarest fish species. Until now, only 20 to 40 individuals of red handfish have been identified in the whole world. The new find expands the number of unique fish that has born with finger-like fins.